As Sheikh ducked to save himself, three bullets hit the bus owner, Harsh Desai, who was sitting by his side. SURAT: It was raining bullets but the remarkable courage and presence of mind shown by driver Salim Sheikh from Gujarat helped save many lives in the terror attack on a bus of Amarnath pilgrims in Jammu and Kashmir that left seven dead, according to survivors' accounts today. Sheikh, the driver of the bus belonging to Om Travels from south Gujarat's Valsad town which was carrying 51 pilgrims, showed grit and determination, as he kept driving the vehicle in pitch darkness last night unfazed by the hail of bullets fired at the bus. The driver applied brakes to the bus only after reaching a military camp, some two km away from the site where they were ambushed, saving many pilgrims who were in the bus, said an injured male survivor, lying on a stretcher. 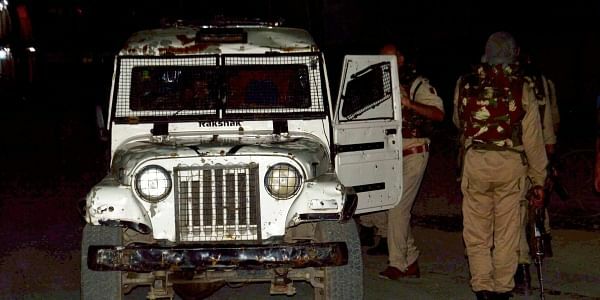 The bus bearing the registration number GJ09Z 9976 was attacked by terrorists around 8.20 pm near Khanabal in Kashmir's Anantnag district when it was on its way from Srinagar to Jammu, police said. Seven pilgrims, including six women, were killed and 19 others injured in the worst attack on the annual pilgrimage since 2001. An injured woman survivor said the bus was fired at from all sides but the brave driver continued to drive. "We were fired from all sides but our driver took us to safety," she said. The J&K Government announced an award of Rs 3 lakh to Salim for his exemplary bravery. The Amarnath Shrine Board too announced an award of Rs 2 lakh. "God gave me strength to save their lives. At around 8 pm yesterday, the terrorists started firing. They kept on firing non-stop from the front," Sheikh said. "I decided to keep on driving, and ducked to avoid getting hit. I kept on driving until we reached a safe place," he told reporters after arriving at the airport here. Though Desai fell down, Sheikh, undeterred, kept on driving the vehicle. "As we were on the way, we heard the sound of bullets like someone was bursting crackers. As we realised it was a terrorist attack, I asked Sheikh to keep driving until we reach a military camp. He kept on driving for two kilometres and stopped only after reaching the military camp," Desai told reporters. "We kept on taking the bus forward amidst the heavy firing. We were able to save many lives," he said. The driver's courage also touched Chief Minister Vijay Rupani, who said he will recommend Sheikh's name as well as the bus owner to the Centre for a bravery award. "I salute Salim Sheikh and Harsh Desai as I have learnt that they showed exemplary courage by driving the bus for almost 2 km despite heavy firing by terrorists. "I would like to thank them for the way they saved the lives of pilgrims by driving the bus without stopping amidst the firing. Had they stopped there, many more might have been killed," Rupani said. The chief minister also had a brief talk with Desai and Sheikh. "We got late in the night when we were returning from Amarnath and were attacked. That was a horrific scene which I will not be able to forget," said an elderly woman who survived the attack, as she thanked the driver. The bodies of the seven pilgrims killed were today brought to Surat airport along with the injured people and their family members in an IAF plane.